Welcome! 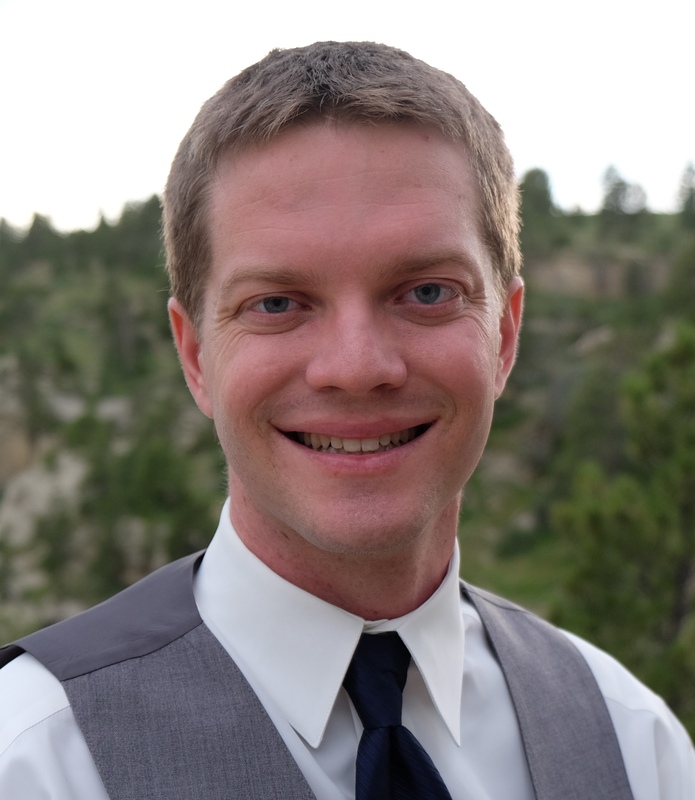 My research spans statistical machine learning and its applications in healthcare and the sciences. I am an Assistant Professor in the Dept. of Computer Science at Tufts University. Previously, I was a postdoctoral fellow in computer science at Harvard SEAS, advised by Prof. Finale Doshi-Velez. I did my Ph.D. in CS at Brown University in May 2016, advised by Prof. Erik Sudderth (now at UC-Irvine). Semi-supervised learning: Our paper at AISTATS 2018 fits latent variable models so that they provide accurate predictions (e.g. drug recommendations) and interpretable generative models, even when labeled examples are rare. Explainable AI: Our paper at AAAI 2018 introduces "Tree Regularization", a method to optimize deep neural networks so learned class boundaries are similar to decision trees (the trees can then be inspected by domain experts). Please consider submitting a short paper! [Aug 2018] I'll present a tutorial -- "Machine Learning for Clinicians: Advances for Multi-Modal Health Data" -- at MLHC 2018. Goal: make healthcare professionals aware of the latest tools from ML and help them be research effective collaborators. Please visit the Tutorial Website (with outline, slides, and full bibliography). [Aug 2018] I have joined the faculty at Tufts' Computer Science Department! I'm actively looking for students (ugrad and Ph.D.) for various research projects. Please contact me if interested. Our winning 2-page short paper was a compact summary of our AISTATS 2018 paper: Semi-Supervised Prediction-Constrained Topic Models. 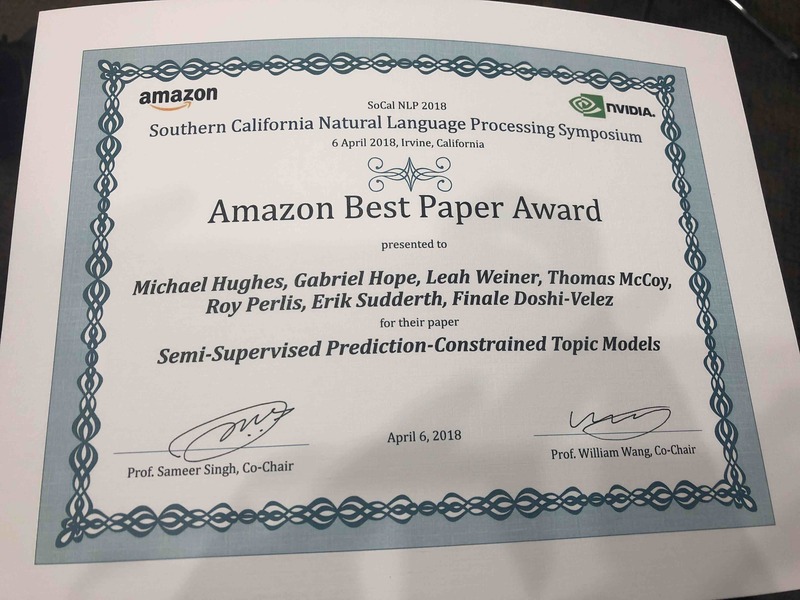 Thanks to co-author Gabe for presenting the work, to the SoCal NLP organizers for hosting, and to Amazon for sponsoring the award. [Jan 2018] Paper accepted to AISTATS 2018. Our paper -- Semi-Supervised Prediction-Constrained Topic Models -- describes a new framework for training topic models and other latent variable models to improve supervised predictions while still providing good generative models with interpretable topics. The new approach fixes core issues with past methods like sLDA, and shines especially in semi-supervised tasks, when only a small fraction of training examples are labeled. [Nov 2017] Paper accepted to AAAI 2018. Our paper describes a new regularization method to optimize recurrent neural networks to have more interpretable decision boundaries (closer to the decision trees that clinicians like). "Optimizing Machine Learning Models for Clinical Interpretability"
Please submit some awesome papers! Fast per-document inference for supervised topic models at ML for Health workshop. HDP models for natural images at Practical BNP workshop. You can now find me at my new office in Maxwell-Dworkin (MD 209). [May 2016] Successful Ph.D. defense! Many thanks to family and friends who supported me along the way. [Jan 2016] Invited talks on my thesis. [Dec 2015] Invited talk at NIPS 2015 workshop. [Sept 2015] Paper accepted at NIPS 2015. Our paper [PDF] describes a new algorithm for Bayesian nonparametric hidden Markov models that can handle hundreds of sequences and add or remove hidden states during a single training run. [May 2015] Paper accepted at AISTATS 2015. Our paper [PDF] describes a new algorithm for topic models that can effectively remove redundant or junk topics during a single training run.